The CT Welcoming Schools Initiative was born out of a desire to improve family involvement in schools and after school programs. The key to engaging parents is to make their schools "feel like family. " 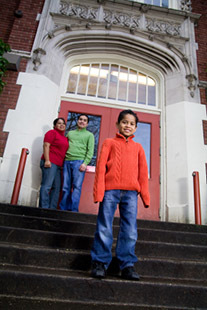 Schools that extend a genuine welcome and are inviting to families have strong partners in education.The Initiative aims to make parents feel welcomed, to celebrate the diversity of the school community, and set unique goals to improve how inviting the school appears to its community, which ultimately have a positive impact on student achievement. This 1.5 hour session provides school districts and after school programs with an overview of the principles of family engagement, highlighting the benefits of active parent participation in the Welcoming Schools Walkthrough. This interactive overview includes video clips, group activities and discussions and is an ideal first step to build support for the initiative. This half-day workshop incorporates practice videos, hands-on group activities, and discussions. Participants leave with information and resources related to family engagement principles, training on the Welcoming Schools process and the complete Welcoming Schools manual. Participants of this training are ready to implement the CT Welcoming Schools process in their own schools. Facilitators implementing the Welcoming Schools Initiative in their district or program for the first time may want additional, on-site support. Technical support can include a half-day planning meeting with the Welcoming Schools trainer and key staff and/or co-facilitation of the Welcoming Schools Walkthrough. Once the Welcoming Schools Walkthrough is completed, information is compiled into a summary report to be presented to the school community. Your Welcoming Schools trainer can provide report writing services summarizing all Component Team Reporting Forms and parent and staff surveys. Your Welcoming Schools trainer can also provide technical support to develop an action plan to implement recommendations from the Welcoming Team. The physical appearance of the facility is an essential element in creating a welcoming atmosphere. Tour your school’s parking areas, signage, entrances, offices and hallways. Be sure to take notes of your observations while touring the building so you will be able to discuss your observations and complete the Reporting Form with your teammates at the conclusion of your tour. School-wide practices and policies can enhance or undermine a welcoming atmosphere. Your team will interview your school’s principal. Please take notes so you will be able to discuss his/her answers and complete the Reporting Form with your teammates at the conclusion of the interview. The attitudes of the staff members are an essential element in creating a welcoming atmosphere. Your team will quietly observe the behaviors of school staff, including phone etiquette and interactions between staff, students and families. Be sure to take notes so you will be able to discuss your observations and complete the Reporting Form with your teammates at the conclusion of your tour. Written materials and school websites are often used as a communication tool between the school and their families and community. Announcements, newsletters, forms and the school website are reviewed in this components. Be sure to take notes so you will be able to discuss your observations and complete the Reporting Form with your teammates at the conclusion of your tour.